Today, there is a lot of growth of video usage on mobile platforms, with tablets leading the way. Based on recent numbers, tablet penetration is growing faster than any device in recent memory jumping from 45 million U.S. adults in January 2012 to 59 million in August. With smartphone penetration exceeding 50% in the U.S. late 2012, streaming to mobile devices continues to grow. As part of the data Conviva recently released on the quality of service metrics for streaming, when it comes to reliably delivering video to mobile, nearly half of all the streams they monitored in 2012 experienced buffering issues. A for which mobile platforms performed better, iOS devices beat Android devices in every category. 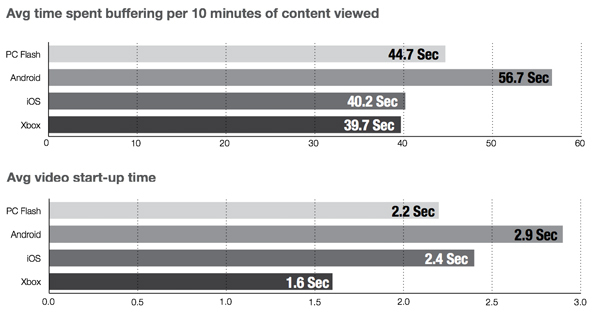 The average time spent buffering per 10 minutes of content for iOS was 40.2 seconds while Android was 56.7 seconds. 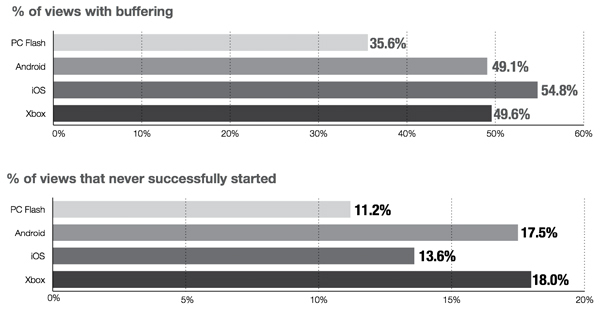 Average stream startup time for Android was slower than iOS (2.9 seconds versus 2.4 seconds). The percentage of Android streams that failed to start was higher than iOS (17.5% versus 13.6%). No clear winner has emerged in the mobile platform war when measured against the three important parameters of buffering, start-up time and failed starts. Mobile has a long way to go when it comes to being a reliable platform for high-quality video consumption and a lot of that has to do with the mobile carriers. While they imply that they want consumers to use their networks to watch video on mobile device, they really don’t. It’s one of the reasons why they have caps on data usage and keep them so low. How much video can you really consumer when you only get 2GB of data transfer a month and then have to pay $10 per GB after that? When Netflix’s average mobile video stream is delivered at 400Kbps, that means you can only consume about 11 hours of video a month before you blow through your quota. And that does not include any data transfer from surfing the web or doing other online activities, which counts toward your quota. In reality, the average person can probably consume 5-6 hours of video a month, over 3G or 4G, without going over their cap. That’s why most video consumed via tablets is done so over WiFi, not cellular connections. Mobile video still has a long, long way to go before mass adoption, at reasonable quality, for long-form content.